I saw this recipe this morning at Delight Gluten Free while looking for a cool dish to serve this hot weekend. It looks so good and simple I wanted to share with you all. Be sure to check out their website for other great recipes and tips! This dessert is perfect any time you want that special creamy dessert and don’t want to use your oven. Your friends will ask you to make this over and over! To make the crust, melt the butter and in a small mixing bowl, combine butter with the gluten-free graham cracker crumbs. Press the mixture into the bottom of a 9” pie dish or a spring form pan. To make the filling, in a mixing bowl and using an electric mixer, beat the heavy cream with the sugar to soft peaks. Set aside. In a separate bowl, mix softened cream cheese, vanilla, lemon juice, and cinnamon on low speed. Gently fold the whipped cream into this mixture. Pour on top of crust and place into the refrigerator to set. Meanwhile, in a pan over medium heat, melt the butter for the topping and add the sugar, cinnamon, and the apples. Cook until the apples are softened; remove from heat and cool. 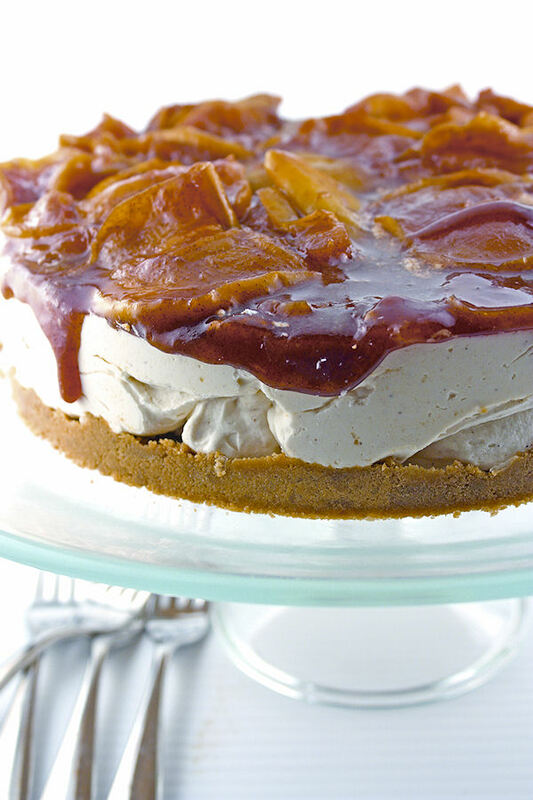 Serve the cheesecake with the apple topping. Vinegar has been around for hundreds of years and there are a bazillion uses for it. OK, so I am exaggerating a little, but there sure are a lot of ways to use it. One of the most obvious is cooking! This is good for us since most vinegar is naturally gluten-free except for malt vinegar which is made from barley. What you may not realize is that white distilled vinegar can be used hundreds of other ways that can be ecologically friendly and economical too! My mom always used it for so many things and I have followed in her footsteps! Tenderize meat by using marinades made from vinegar. When poaching eggs, a little white distilled vinegar in the water will help the whites stay better formed. A teaspoon or two of white distilled vinegar when boiling or steaming cauliflower, beets or other vegetables, will help them keep their color, improve their taste, and reduce gassy effects. A dash of white distilled vinegar to water as pasta cooks will make it less sticky. A spoonful of white distilled vinegar to any chocolate cake (box or homemade) will add moistness and taste. A drop of white distilled vinegar added to frosting will keep it white and shiny and keep it from sugaring. Add a teaspoon of white distilled vinegar for every 3 to 4 egg whites used in meringue. It will be perfect and fluffy. To keep olives or pimentos indefinitely, cover with white distilled vinegar and refrigerate. Add a tablespoon or two of white distilled vinegar to water when boiling eggs to keep them from cracking. Your windows frosted? 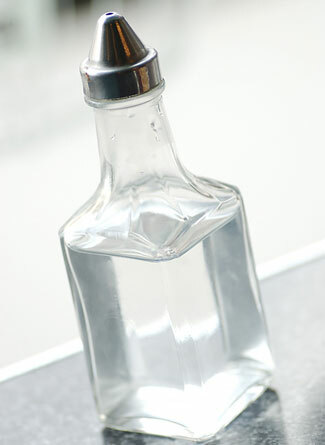 Coat them with a solution of 3 parts white distilled vinegar to 1 part water overnight in winter for frost-free windows! Full-strength white distilled vinegar on a soft cloth will polish car chrome. Want to remove unwanted decals and bumper stickers? Cover them with a cloth soaked in white distilled vinegar and they should peel off in a couple hours. You can also repeatedly spray them with full-strength white distilled vinegar. Road grime comes off windshield wipers by wiping them with a white distilled vinegar-soaked cloth. A rinse made from 3 parts soft water to one part white distilled vinegar will get rid of hard water stains. Spray and wipe inside windows with white distilled vinegar will remove the hazy film that builds up. A mixture of half white distilled vinegar and half water will remove dirt and stains from car carpeting. Dabbing insect stings and bites with a cotton ball saturated with undiluted white distilled vinegar will stop them from itching. Sunburn!! Spray skin with white distilled vinegar (ice-cold will feel even better), repeating as often as you like. This will sooth your sunburn and may prevent blistering and peeling. White distilled vinegar is an antiseptic for cuts and scrapes. Washing feet well with antiseptic soap daily, then soaking them in undiluted cider vinegar for 10 minutes or so will help to get rid of foot odor. Also – cotton socks aid odor control more effectively than wool ones. Equal parts white distilled vinegar and water make a great facial toner. Undiluted white distilled vinegar can be used as aftershave. Rubbing on full-strength white distilled vinegar will lighten body freckles (not facial freckles). Brushing your teeth once or twice a week with white distilled vinegar will help to eliminate bad breath and whiten them too! Wipe fingernails with cotton balls dipped in white distilled vinegar before putting on nail polish will help to make nail polish last longer. 1/2 cup white distilled vinegar in the wash cycle will prevent lint from clinging to clothes. Add 1 cup white distilled vinegar to a large pot of water, bring it to a rolling boil and drop in stained white socks and dingy dishcloths. Let soak overnight to get them white and bright again. Spray a white distilled vinegar and water solution on food stains like spaghetti, barbecue, mustard or ketchup before washing. Spray full-strength white distilled vinegar on underarm and collar areas before tossing them into the washing machine to remove perspiration odor and stains on clothing, as well as those left by deodorants. Pour a few cups of white distilled vinegar in the machine with moldy smelly laundry and wash in hot water. Then run a normal cycle with detergent. Get rid of mineral deposits in steam vents and spray nozzles on your steam iron by filling the water chamber with a solution of equal parts white distilled vinegar and distilled water. Let it set in an upright position (steaming) for about 5 minutes. After it is cool, rinse the tank with water, refill and shake water through the vents onto an old cloth. Test before using. 1/4 cup white distilled vinegar in the last rinse of your laundry will get your laundry cleaner. It will dissolve the alkalies in soaps and detergents removing the residue from your clothes. It also prevents yellowing, acts as a fabric softener and static cling reducer, and attacks mold and mildew. Wiping a dogs ears out regularly with a soft cloth dipped in undiluted white distilled vinegar should keep it from scratching them. Wiping down the animal with a 50-50 solution of white distilled vinegar and water, followed by a plain-water rinse will help remove skunk odors. If necessary, repeat. Cats do not like the smell of vinegar. Spraying white distilled vinegar on a windowsill (or other surface) or even upholstery will discourage a cat from scratching or going there. Be sure to test this on an unnoticeable area first to make sure there won’t be any discoloration. You can also spray areas outside of your home the rinse with hose to deter them from going or marking certain areas. Try placing paper, a cloth, or sponge that has been soaked in white distilled vinegar in your garden! Pour ½ inch of white distilled vinegar in an empty litter box and let stand for 20 minutes, swish it around, and then rinse with cold water. This will remove cat litter odor. Adding a little white distilled vinegar to your dog or cat’s drinking water to kill fleas. Use a paste made of 2 tablespoons salt and 1 teaspoon white distilled vinegar to shine chrome sink fixtures that have a lime buildup. Scouring cleanser: 1/4 cup baking soda, 1 tablespoon liquid detergent – add just enough white distilled vinegar to give it a thick but creamy texture. To clean and deodorize a drain or garbage disposal: pour 1 cup baking soda, then one cup hot white distilled vinegar down drain or disposal. Let this sit for 5 minutes then run hot water down the drain. Place 1/2 cup white distilled vinegar and 1/2 cup water in a microwave-safe bowl in your microwave. Bring mixture to a rolling boil. Wipe clean! Your baked-on food will be loosened, and odors will disappear. Clean your refrigerator shelves and walls with a half-and-half solution of water and white distilled vinegar. You know that grime you get on the top of the refrigerator? A paper towel or cloth and full-strength white distilled vinegar will clean it off. Saturate your grease splattered oven door window with full-strength white distilled vinegar. Keep the door open for 10 to 15 minutes and then wipe down with a sponge. Pouring a cup of white distilled vinegar inside the empty machine and running it through a whole cycle will remove soap buildup and odors from the dishwasher. Narrow-necked glass jars, flower vases, and bottles that have that yucky film can be cleaned by letting undiluted white distilled vinegar sit in them for a few hours. To loosen stubborn stains add a little rice or sand and shake vigorously. If necessary repeat. Clean your mini blinds easily by wearing pair of white cotton gloves. Run your fingers across both sides of each blind after having dipped the gloved fingers into a solution of equal parts white vinegar and warm tap water. Spraying undiluted white distilled vinegar outside doorways and windowsills, around appliances will discourage ants and pests from coming in. Set out a small dish of undiluted white distilled vinegar to get rid of fruit flies. Bathroom germs can be killed with a spray of full-strength white distilled vinegar follow up by wiping clean with a damp cloth. Grime, mildew, and scum from the tub, tile, shower curtain or door, can be cleaned by wiping with undiluted white distilled vinegar and then rinsing with water. Get rid of the hard water deposits on shower doors by spraying them with full-strength white distilled vinegar. The tracks can be cleaned by filling them with white distilled vinegar and letting it sit for a few hours. Pour hot water into them and wash and scrub away the scum with a toothbrush. 1/2 cup baking soda, 1 cup white distilled vinegar, and 1 cup ammonia to a gallon of warm water makes an inexpensive tile cleaner. A scummy showerhead can be cleaned by pour 1/2 cup baking soda and 1 cup white distilled vinegar into a sandwich bag and tie it around the showerhead. Let it set for an hour after the bubbling has stopped then remove the bag and turn on the water. Cleaning your no-wax vinyl or linoleum floor with a solution of one cup white distilled vinegar for every gallon of water will give it a shining finish. For tough stains, apply full strength and let sit for 10-15 minutes before cleaning. A great economical and environmentally friendly floor cleaner can be made by mixing a solution of 3 drops dishwashing liquid to 1/3 part white distilled vinegar, 1/3 part alcohol, and 1/3 part water. For fast clean up spray sparingly and mop. Add about 1/4 cup white distilled vinegar to reduce soap bubbles in a steam cleaner. To remove detergent residue and make carpets stay fresh longer, use the same amount in the rinse water. Window cleaning solution: 1/2 cup non-sudsy ammonia, 1 cup white distilled vinegar, and 2 tablespoons cornstarch in a gallon of water. Wiping down walls with undiluted white distilled vinegar on a cloth or a sponge mop will get rid of mildew, dust, and stale odors. To remove wallpaper: Use a paint roller to wet the surface very thoroughly with a solution of equal parts white distilled vinegar and hot water. Dead mouse or other rodent smells (after removing all animal remnants) can be removed by wiping down the area with either white distilled vinegar and then placing a fabric softener sheet in the area to remove any lingering odors. So there you have it. OH and one other thing, if you are worried about that smell…….relax! Once dried, it has no smell! There are a ton more way you can use vinegar but hopefully this will be enough to get you started! Since I am always on the quest to optimize my health, trying to find gluten free energy bars THAT I LIKE the taste of has been challenging. I ran across this and think it might be the key to getting something tuned to my tastes. Matt Frazier at www.NoMeatAthlete.com posted a recipe that is completely customizeable to your likes or allergies! 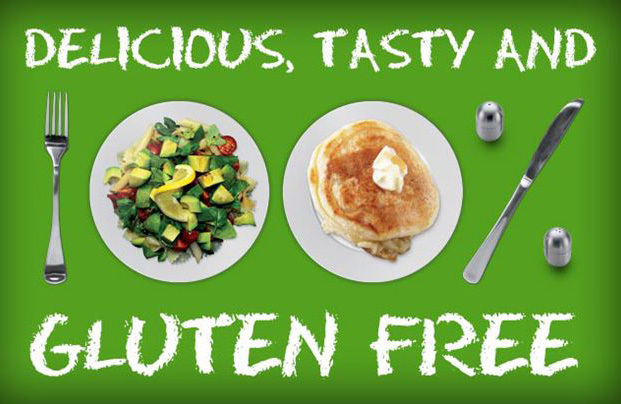 NOTE: Make sure all of your ingredients are GLUTEN-FREE! In a food processor, combine beans, binder, sweetener, soft fruit, extract, spice, and salt until smooth. Add the oats and dry base ingredients and pulse just to combine. Add stir-ins and pulse again just to combine. If the consistency seems spreadable, you’re good. If it’s too dry, add 1/4 cup of water; if it’s too runny, add an additional 1/4 cup of the dry base ingredient. So that’s the basic formula! To help get you started, here are three variations. For each of them, follow the same procedure from above for mixing and baking. So there you go, three examples to get you started. But really, the point is for you to create your own, using the basic formula as the framework.